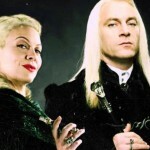 Wizarding Wednesdays are back! 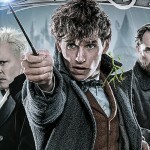 Those magical midweek giveaways we looked forward to leading up to the release of Crimes of Grindelwald last fall have returned in celebration of the arrival of the DVD and Blu-ray release next month and some pretty spellbinding prizes are being offered each week through April 10. #WizardingWednesdays returns with the chance to win a personalised Platform 9 3/4 Gift Trunk packed with #FantasticBeasts goodies! 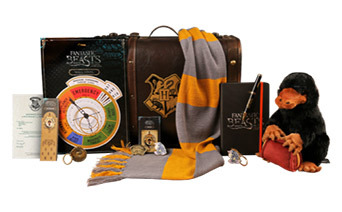 This week’s prize is a Platform 9 ¾ trunk personalized with your initials and loaded with Niffler Plush, Newt Scamander Scarf, Pen, Notebook, Wall Vinyl, Bookmark, Magnet, Pin Badges, and Keyrings. It even comes with your own personalized Hogwarts Acceptance Letter! 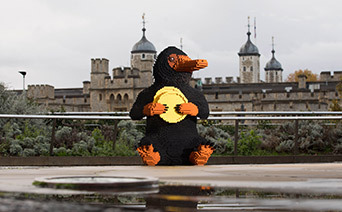 Some of the loot offered in the weeks to come include that Engorgio’d LEGO Niffler set like the ones seen around London last year, a poster from the film signed by the cast, and a chance to be among the first to tour the new Gringotts feature at Warner Bros. Studio Tour London. And if you don’t win that week’s big haul, runner up prizes are available each week as well. Unfortunately only UK/ROI fans are eligible, but the good news is you only have to enter once to have a chance every week. 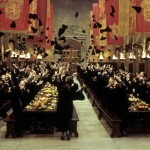 This round of Wizarding Wednesdays goes through April 10, so keep your eye out for the weekly contests. Winners are announced the following Wednesday each week. Head to the Fantastic Beasts UK website to check out all of the weekly prize details and to enter. Digital download of Crimes of Grindelwald is available March 9 and out on DVD and Blu-ray March 18.